Do you have to struggle everyday to securely keep your valuables like mobile phone, cards, keys or money while you hit the track for running? The water resistant zipper prevent the water from coming inside. And you can get it washed in the washing machine since it was covered with sweat and other liquid after the running. There are three main pockets with different function, fanny pack with pockets is for storing the cellphones, keys, credit cards and other personal items. - Size: About 88 * 10 * 3 cm/ 34.6 * 3.94 * 1.18 inch(L*W*H). - The water bottles are a perfect size and volume for runners. Material: Lycra material. Size: About 88 * 10 * 3 cm/ 34.6 * 3.94 * 1.18 inch(L*W*H). The pouch is large enough to fit most cell phones, 4-6 inch phone. The water bottles are a perfect size and volume for runners. Keep your ID's and credit cards safe. This will make sure you don't lose them and you have access to your funds. 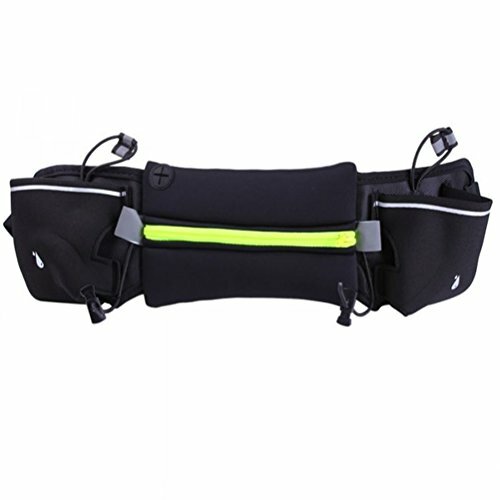 The running belt lets you adjust the fit to it sits perfectly on your waist without bouncing.